A must for those prone to falling. You can now let them sit in the lounge, dining room or in their bedroom, on a pressure reduction cushion and know immediately they attempt to stand up. 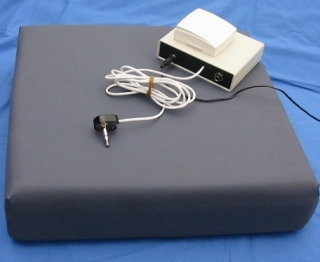 The cushion has a switching pattern connected to a transmitter installed inside which will trigger and transmit when your resident/patient attempts to stand. This signal is picked up by a receiver attached to a Biovations control box which in turn interfaces with your Nurse Call system. Receiver should be no further away than 12 metres, which means there must be a call system socket and power point within that distance from the cushion placement.